February 28, 1999 Astronomers at the Siding Spring Observatory in Australia stared with bone chilling shock at the resent photos taken of the sky. They were comparing the objects in each photograph for size and velocity. One faint object was growing in size but was not moving in any direction. Measuring the change in size with the time of each photograph, the speed of the object was calculated at over 43,000 miles an hour. Within hours other observatories searched and verified the objects size at 100 feet long with a trajectory that crossed our orbit putting it on a collision course with earth in less than 36 hours. Within 24 hours, with all observation positions around the globe tracking the asteroids course, the final calculation showed the asteroid would pass between the earth and moon on March 2nd at 13:44 universal time (8:44 a.m. ET) Everyone who knew about it could not sleep that night, if their calculations were wrong it could be a disaster similar to a nuclear explosion. I believe everyone one held their breath the last seconds from the 43rd minute to the 44th minute of what was either going to be a miraculous flyby or a deadly, devastating impact. On March 2nd at 13:44 universal time (8:44 a.m. ET) asteroid 2009 DD45 at 43200 miles an hour, like a monstrous bullet, shot between the earth and moon. Many gave silent prayers, others hugged their children and loved ones while no one else really noticed nor did the news agencies give it any attention. Did you feel it? Did you feel the impending doom when the asteroid was approaching? If not you will be given another opportunity. In 2004 an asteroid 1150 feet long ( the size of the rosebowl stadium!) and weighing 23,0000 ton was discovered and unlike the afore mentioned asteroid there has been enough time to properly assess it’s threat potential and with great precision project it’s path, because it has a collision course with earth in 2029 (not 2012). When will our orbit and the asteroid collide? Are your ready for this? In April. What day? On the 13th day and what day of the week is that? It’s a Friday. With that knowledge they named the asteroid “marshmallow” 🙂 (no! just kidding) They gave it the name of Apophis, the Egyptian God of death. 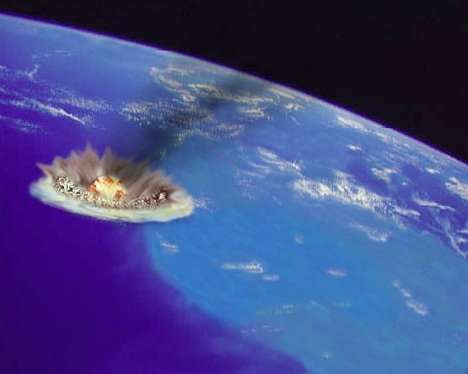 If this asteroid hits the earth it is going to be very bad! How bad? All the dinosaurs will be become extinct! Wait, they are already extinct. Well then if it hits the earth it will really ruin everyones day! The good news is its not going to hit the earth! How close will it come? It will shoot between the earth and our communications satellites. Do you know how close that is? (Your Dish TV and cell phone will probably not work and it will not be wise for any aircraft to be flying that day either!) What is the bad news? Well our earth’s gravity is going to drastically change the course of that asteroid when it flies that close to the earth, so much so that it might change it’s course and hit our earth 7 years later 2036. Where would it hit? More than likely it will hit in the Pacific ocean between Hawaii and Los Angeles, which will cause 5 consecutive tsunami waves radiating from the impact area; the first one being 3 MILES HIGH ( This is not a good thing! ) If this asteroid hits it will ruin everyone’s day and cause some very major life style changes for everyone who lives on the Pacific coastline! On 27 July 1993 the requirement for EMS and a door through 1 meg memory limit in 16 bit computers was unlocked and opened with the ability to write more complex and intelligent programs with the arrival of the 32 bit Windows NT. The impact created a technical tsunami wave that changed every computer. The ripples are still felt today with the advanced graphics editing programs using Microsoft XP and our graphic intense cell phone! The advanced 32 bit programs allowed photo quality image capture and printing. Where did the corner overnight photo developer and printer shops go? Where did the public telephones and phonebooths go? Swept away by 32 bit programing tsunami! Did you feel it? The twinge of unfamiliarity with the world? The need to relearn how to make a simple phone call. To relearn how to take a photograph with a digital camera. To learn how to modify the image and print it out on a printer. Where is the typewriter? What is happening to the fax machine? What is a website or a blog? Have you learned to tweet and do your tweets link to your Facebook? If you missed it you have another opportunity. The 64 bit operating system now has the engines to really run it. Four years ago the two-in-one processor came out. Two years ago the four-in-one processors came on line. Now with the 32 bit operating system reaching it’s maximum limt and the demand to do more than the 32 bit operating system can perform the technical tsunami has begun! 64 bit programs will change everyone’s day and cause some very major life style changes for everyone! I know this sounds like something out of a Monty Python movie i.e. ” The Killer man-eating bunnies” but its true! These remarkable creatures change everything about what we thought we knew about their species! Imagine you are in Siberia, Russia and it’s spring time. The flowers are in bloom, birds are singing and moths and butterflies are fluttering all around you. Happiness is everywhere ! Then without any fear a few dainty moths alight upon your hands. Then suddenly you feel a needle like sting as these dainty moths stab you with their sharp barbed and hollow tongues to dine on your blood! Now let’s go to a tropical habitat in Southeastern Mexico and Northwestern Costa Rica where the acacia plants live and the amazing Bagheera Kiplingi jumping spider lives. The acacia plant has a special arrangement with an aggressive ant species that lives within it and protects it. These ants patrol over the whole plant protecting it from other insects and animals. What is specifically guarded is the nutrient rich buds of the acacia. Now comes into the picture the amazing Bagherra Kiplingi jumping spider. Who will jump from thorn to thorn of the acacia just barely escaping the jaws of the patrolling ants untill it finally arrives at an acacia bud to which it buries it’s fangs into it and using it’s full physical strength it extracts the bud and makes it’s get away with it’s vegetarian meal in it’s fangs! Just like the vampire moth and the vegetarian spider have changed everything about what we thought we knew about their species. So too, the i5 and i7 Intel Processors have changed everything we thought we knew about computers! Image you are at your computer you have now. Play a DVD video. Now minimize it. Now go to your Internet browser and access a movie on the internet and play it at the same time. What is happening? Your processor has two things to do. So it hops from one to the other dividing its power between the two. Will there be glitches? a little. Now go to your Antivirus program and do a FULL virus scan. Now what is going on? Your processor has three things to do. It must keep hopping from one to the other to keep them going. This brings to my mind a juggler trying to juggle three different things, trying frantically to keep them in the air! You will probably hear your computer’s fans kick in about this time as the processor gets hotter trying to keep the all processes going. Will there be any glitches? The movie will probably freeze for a few seconds then continue as the processor catches up hopping from one to another. Ready for the big one? Now while all this is going on; let’s check your email! You know what will happen don’t you? The processor is going to lose it! Do the words “freeze up” or “lock up” sound familiar? You know, where the keyboard or mouse will not respond and the same image is on the screen and nothing changes? What happens when you have an i5 processor in your computer and duplicate the same actions? NOTHING! Everything works and continues to work as if each program was the only program running in the computer! What is going on? The processor is not just one with 4 heads, the new design has each core processor act as a separate processor for each application running. It is truly like having 4 computers in 1 ! What is the difference between the i5 Processor and the i7? Well the design of all the previous computers is like a juggler with one arm. So with the i5 processors you have 4 jugglers with one arm; but with the i7 Processor you have 4 processors with 2 arms; allowing the computer to be 8 computers in 1! Why is there a Blue Screen of Death? Everyday more and more we are seeing the “Windows Blue Screen of Death” not just on our computers but on buildings on airplanes at gas pumps and at the airports. As more and more computers are being integrated into our daily lives the Blue Screen of Death becomes more visible. The other operating systems also have failure screens but because of the brilliant blue of the Microsoft Failure screen we remember it more strongly. Here are the failure screens of other operating systems. The “Sad Mac” of the Macintosh Computer. Why is there a blue screen of death? The answer is PEOPLE ! I know and your response would be “WHAT?”. One of the greatest “AH HA !” moments came when I was at a Programmers Conference, which are called technically a “Developers Conference”. There I had the unique privilege of meeting the people who wrote the programs and operating systems that you and I are so familiar with. What I thought was so amusing was by talking to each person I knew what programs or operating system they wrote by their personalities. It only took a little while but you could tell. It was as if I already knew them. Then the “AH HA !” moment happened and I understood; the logic of the programs they wrote were modeled after their own logic and way of thinking! That is the reason there are failures! To explain it better picture in your mind a big dance party, and that the operating system is like the song or dance tune being played. The male dancers are the hardware, while the female dancers are the software. The beat or timing comes from the band musicians with their instruments, and the dancers are all moving to the beat of the music. All around the room in chairs are men and women ready to get up and dance when there is room on the dance floor. How many pieces of hardware and software can dance depends on the size of the memory which would be the dance floor. The faster the musicians play the faster the dancers dance. What happens when dancers collide or step on each others feet? Then we have a program error and the dancers leave the dance floor (the program must shut down.) What happens when dancers slip and fall into the band or knock down other dancers? That is when the music stops or a “Blue Screen of Death” everyone has to stop and the music starts over again. You see the same problems of logic and actions that people have in their lives is the same in their programs. They model their programs after their own way of thinking! As you watch the video think of what is going on in your computer! Remember programs and operating systems are modeled after the thinking and logic of the programmers that wrote them! So when will we stop having blue screens? When people no longer write programs and operating systems! When the computers write the programs and not people! Picture in your mind a dance party were the musicians and everyone dancing are robots, no mistakes, the whole dance is flawless! Wouldn’t that be fun to watch? Well the program on the terminal screen isn’t in the terminal, the program is on a server which may not be in the same state! I know what you thinking ” this technology is over 40 years old!” You are right! Millions of terminals could connect to a few servers at the same time and it was called Master -Slave but since then for Political Correctness sake it was changed to Client-Server. Well what if you repackaged it and the terminal did some real cool stuff and could run multiple programs on several distant servers, what would you call it? It already has a name; it’s called Cloud Computing! The story of civilization is taking the individual from Independence to dependence from privacy to being fully exposed. An example would be water. Before, everyone had their own well for water, now it’s a utility, everyone shares and you have to use ONLY what they want you to have and how they want you to have it. So you pay for that utility of receiving water and still buy bottled water! It is the same with food! Now the last bastion of independence and privacy; what interests us, what we write and how we run our business; will be totally naked and accessible by anyone with perceived reasonable authority. Why would anyone want to lose their Independence? The answer is one word COST! The average person is after enjoyment, fun and communication. If they bought a computer it was for that purpose. If not, it was because it was too expensive and usually the cell phone, though limited, would suffice. But now that is about to change. Two years ago a computer notebook cost around $2500 with software. Now a net-book (the net part of the word for interNET) costs you $400, using the Intel Atom Processor (a midget Pentium 4 on steroids) and you can use applications such as wordprocessing, spreadsheets, databases and acounting from off a distant server (Really big computer). Next year Intel will cut the cost of the processor almost in half ! While Arm, who makes the processor for the cellphones, is coming out with their own prosessor called snapdragon for the NET book (slave side of Master-Slave, oops I mean Client-Server). The snapdragon configured computer (NETbook) is taunted to be $100 or free with signup, like with a cellphone. What about the really cool stuff part? Well since you are not running any programs on the unit itself but on a distant server, you can have full communication with someone right on the netbook. What I mean is full audio and VISUAL! IF you wanted to show him/her something on your netbook you could show your screen image to them, wherever they are. Or they could just see and hear you. Each one is scheduled to have a video camera with microphone focused on you when you open the lid. Where? Right above the screen. The battle for your privacy has already begun. Just like in chess. The board is set and the pieces are in motion. Who are the pieces? The king for the white is Intel Corp. for the black is ARM. The queen for the white is AT&T the queen for the black is Verizon. The bishops are Intel’s communication branch while on the black side Qualcom.The knights are the technologies of voice over the internet (voice over IP) or internet over voice lines which encompasses the router companies like Cisco and Juniper. The rooks (castles) these are the applications that are to be run from servers. This is still in progress as to which side they are to take. Those who are positioning themselves are Amazon, Ebay, Microsoft, Google, Oracle and Apple, just to name a few. Need help choosing and setting up your NETbook give us a call. with the only thing seen in the cloud is your smile! Is the Future Going to be Like Star Trek or Terminator? The future is not going to be either Star Trek or Terminator but something totally different. The future is definitely unsure and filled with unknown variables for any single entity; but include that entity into a large group, then the future of that group can be projected by the known constants or characteristics of the single entity which is common among the group. (stay with me it gets easier as we go 🙂 ) What would help would be an illustration! Lets take a single water molecule in a kettle. The future of what or where that molecule would be is impossible to know. But if we add heat to that kettle we can pretty much know the future of any of the water molecules in that kettle! The same is true for mankind. It is pretty much impossible to know the future for any single person but the future of mankind as a whole is pretty easy to project. So what are the constants or characteristics of an individual that is common among all mankind? Scientifically the needs of all mankind are like a pyramid or a ladder in that no one can go to the second step with out completing the first. Additionally no one can maintain that level or progress to the next if the primary levels are in jeopardy. For all time the first three levels can be attained through large families or combining your family’s wealth or resources with those of another through marriage. But the fourth level ESTEEM is the most difficult and the primary motivator for mankind. To be placed above your peers meant everything. From antiquity, to win the esteem of your tribe, your proof of bravery was required. To kill a mouse wouldn’t cut it 🙂 But to kill a bear twice your height and four time your weight that would win you some major kudos! You would be honored by the chief of your tribe and all other members. The badge of your new found status would be the wearing of the bear claws on your body. Another way to win esteem would be the show of bravery in combat vanquishing your enemy and wearing his armor and sword on your body. Today things have changed, our status and symbols of that status are different but just as crucial to our lives! Today it’s not bravery that wins you status but being associated with that desired level of status and having the represented symbols to be seen by everyone. For today status earned by bravery is not as important as the status given to those in the movie industry or the music industry or sports. For an example let’s say a young teenager was offered the choice to be awarded the Metal of Honor by the President of the United States or be in a movie with Brad Pitt and Angelina Jolie, which would he prefer? Lets replace Brad Pitt and Angelina Jolie with a stage appearance and road show with Brittany Spears, which would he or she accept? The Metal of Honor? In the 1980’s having a portable phone in your car was THE symbol of prestige, status, and importance. Then it was having one that you carried on your body, today everyone has a cell phone so how do you distinguish higher status? Wearing the phone on your ear so you are available all the time; the status of importance. Most of the greatest technological advances do not go outside the individual but attach to or go inside the individual! Every technological advancement gets directly applied to or inside the body of the individual, to give him superiority over his peers. The advancement of laser technology went straight to the eyes. What was wrong with the eyes? Nothing. Lasik surgery is to remove the status lowering necessity of wearing glasses. Wait, there is more then one type of implant 🙂 . Dental implants, hip and joint implants, medical bone replacement implants; all implants start off for only those who are injured or damaged, to regain lost satus and selfesteem, then in no time at all they are used for cosmetic purposes; to increase the status of the individual over his or her peers. Remember all technologicial advancements first go to individuals for medical purposes, to regain lost status and self esteem! Now think about the prestige and status you would recieve if you were wearing one of these! So is it the world that is going to change into Star Trek or the Terminator ? No, It’s what we are inside and out that is changing! What we have been has been terminated. When someone says they have Big problems what do they mean? Here is a comparison of big, Really BIG! My Cephei and W Cephei are the twin stars that make up what we call our north star! So now that we have our big problems in perspective here is a quick synopsis of our present problems and the next big tsunami in technology whos’ waves are already pounding the beach of reality. Is it just about computers? No! everything! Even though God made the heavens and earth and all that is therein we are about to begin the customization of those things of the likes which has never been conceived of before. Do we have the wisdom? Did we have the wisdom when the industrial age dawned? Hmmm. It’s kinda hazy and smokey to really tell isn’t? Then would you say we have the wisdom of a six year old little girl who is going to surprise her parents by cooking breakfast for them without supervision or previous experience? Will there be problems? No? Then would you say we were more like the teenage boy with his first car who is going to rebuild and customize his car’s engine without supervision or previous experience? Does the phrase “screw-loose” mean anything to you? Remember when we did these dumb things (some of us are still doing it 🙂 ) Do we have scars to show for it? The mess from the industrial age is being cleaned up, how be it a bit slow. Now there is no evidence of the bomb but the nightmares are still there. So mankind survived and look what we have now! But the mistakes and problems we are about to make are going to be whoppers! Because they will not be able to be reversed or to be undone. Looking at the plastic surgery and implants now being done today it’s easy to project the outcome and the problems. Does the name Michael Jackson mean anything to you? How about the name Nadya Suleman? Should I mention all the athletes and sports figures that take steroids? Remember what everyone said, that the day we have genetically modified people and real robots is the day pigs fly! May I remind you, this year we have Swine Flu! Here is what has been done genetically to mice resently. and the WORLD will NOT be the same as we know it now. because Kansas is going bye bye.